Exiting the Leffingwell Inn’s driveway, turn right, and drive ½ mile, bearing right at Chelsea Parade, staying on Washington Street (Routes 2 + 32). At the end of the P arade, at the corner of Washington and Sachem Streets is the Royal Mohegan Burial Ground. Turn right onto Sachem Street, and park on the street, or adjacent to the Mohegan Burial Ground on the left. 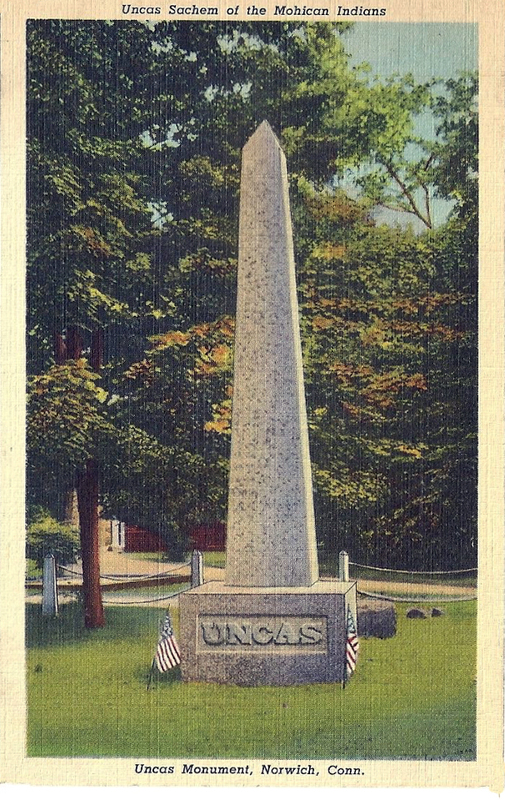 Walk a short distance down Sachem Street, to the obelisk that serves as the monument to Sachem Uncas, “The Fox”. 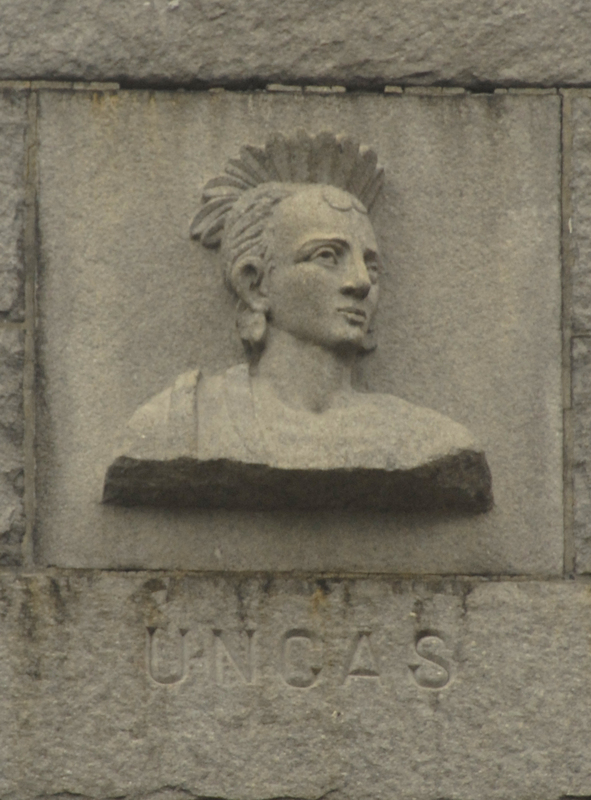 In 1633, Uncas, a Sagamore with the Pequot tribe in what is now the Mystic-area of southeastern Connecticut, broke with that tribe on a dispute about leadership. He and his followers crossed the Pequot (now Thames) River, and established the Mohegan Tribe. In 1659, a tract of land, known as “The 9-Mile Square” was granted by Sachem Uncas to English colonists from Saybrook, who had joined in an alliance with him and the Mohegan Tribe, against the Pequots (1637) and Narragansetts (1643-46). 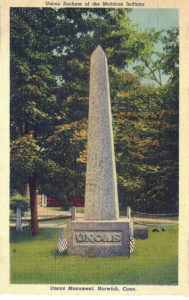 An exception to this land-grant was the Royal Mohegan Burial Ground, which originally occupied 16 acres of sacred land, roughly at the intersection of Washington and Sachem Streets, and which then proceeded southeast, paralleling the Yantic River to the confluence of the Shetucket and Pequot (now Thames) Rivers – the site of present-day Norwich Harbor. Over the centuries, that sacred land has been encroached upon and desecrated, to make way for housing and industrial development, resulting in its being reduced to 1/10 of an acre. Throughout all of the encroachment and indignity – from the 1700s to the present day – the Mohegan people have disputed and protested how the leaders of Norwich were allowing such desecration to continue, and their continuing appeals to the State of Connecticut’s overseers fell upon deaf ears. Gradually their persistence paid off, the tide began to turn, and over many more decades, the City and the State of Connecticut began to right the centuries of wrongs against the Mohegan Tribe. 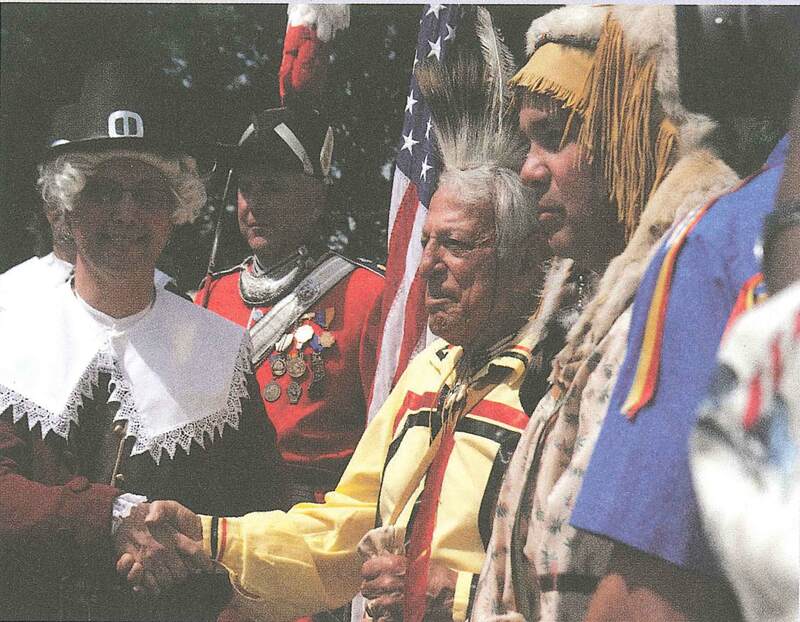 In 1999, a document with the City of Norwich and the State of Connecticut returned a part of the Royal Burial Grounds (over which the Masonic Temple had been built in 1928), to the Mohegan Tribe; and the Masonic Temple was torn down. In 2008, where that building had stood, a memorial to those buried there was designed with native trees and bushes, along with a number of Mohegan symbols that were chosen by the Mohegan Council of Elders.